This course is mostly flat, except for the middle miles take place in Iroquois Park...which winds you uphill for about 3 miles, no exaggeration. You only go downhill to get out of the park, and that is about half a mile. So I knew this was going to be a huge test for me as a Runner. With everything that has happened the past week, I told myself that I wasn't going to walk any of the park. Plus this park will be the halfway point for me in the Marathon. I saw plenty of people giving it their all, doing run/walk, or walk/run combos, and I heard a LOT of cusswords as if the hills were taking this out on us personally. I kept running the whole thing. It wasn't pretty, but I kept going. Never stopping to walk. Coming out of the park, felt nice, just because I knew, at this point, I had less than 40% of the race to go, and running my System Check (check my write up from the Rodes 10K if you missed it, to get that reference). Lungs, Legs, Injuries, etc, and felt good. I had enough to finish this race. 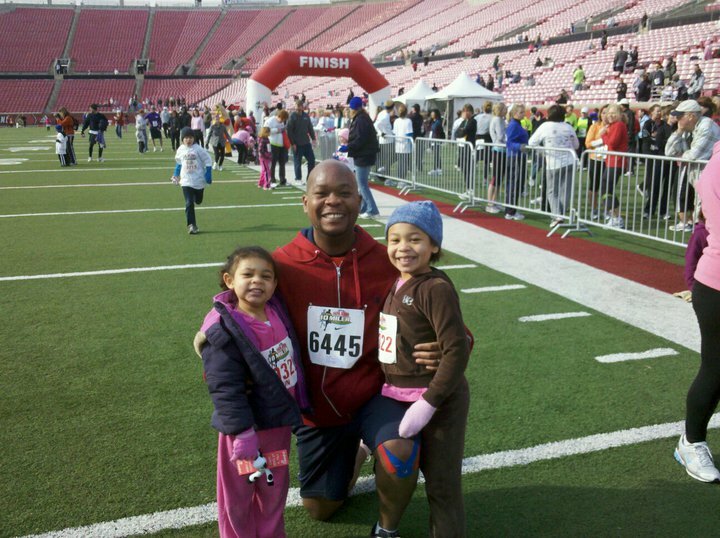 The whole neatness of this race is you finish in Papa John's Cardinal Stadium, and you can see yourself on the big screen in the endzone as you finish. As we turned into the stadium, you could hear people cheering, and I kept waiting to hear the voices of my daughters and wife. Any good Husband/Father can be in a busy stadium full of people and identify the sounds of his family amongst the noise. 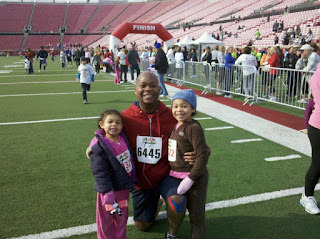 About 20 feet from the finish, I heard my youngest scream, I saw her, and saw my family. I waived to them, and they cheered me through to the finish line. The Huge Big Screen in the endzone is right at eye level as a runner, so I looked for myself as I stretched my arms out and said, "I did it!" For the next few seconds, the past 6 weeks ran through my head. I thought of everything I was gong through a year ago, medically, and here I was, having completed the Louisville Triple Crown of Running. 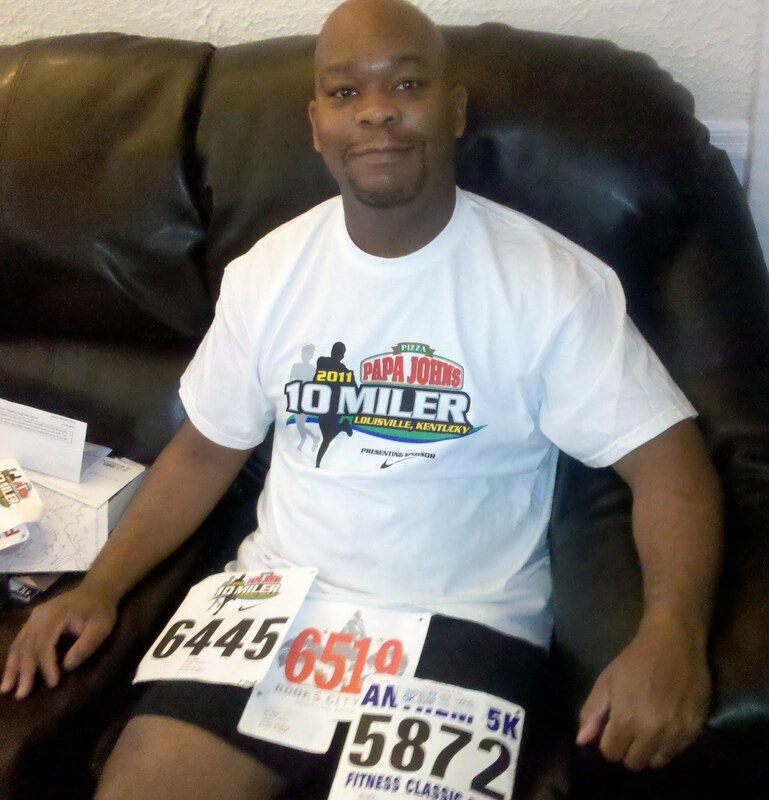 I am on the verge of celebrating my one year anniversary as a runner, and on the verge of doing my first marathon. That is 4 weeks away, and I will embrace that later, but for now, I am going to be proud of the guy who ran his first 5K (4/17/10) in 45 minutes, and ran the Anthem 5K (2/26/11) in 32 minutes. I am going to be proud of the 10 miles I put in, at somewhat was my 5K racing pace the entire time. I am proud at the difference of my new body in that year's time, and yes I have more work to do. I will rest for a couple of days, and then the clock resets for the Derby Marathon. If you're still here reading this, thank you. I will say this, don't EVER believe you can't accomplish something. You don't need anyone but yourself to believe in you. You are your biggest source of motivation and inspiration. If you have dreams and want to accomplish them, remember this: You Are More Than People Say You Are. Gossips Distort You. Mockers Belittle You. Friends Endorse You. And GOD Stands By You. love this recap!!!! you are so awesome,and have such strong determination and HEART!!!!! now go enjoy your rest with your beatiful family!!! Corey, so glad to be a part of this running journey with you. And I hear you on the on changes in body, mind, and spirit over this last year. Hope you're taking a day to savor the accomplishment. Still grateful to God for introducing us! Run on, brother! LOOK HOW GREAT YOU ARE LOOKING. Slim and trim in your name!!!! Just read the last paragraph to my three boys (7,9 and 13)...WOW! Embrace this moment! Revel in your victory! You are more than a conqueror!